At ADI we have a mission of providing our customers with the quietest and most efficient leak investigation possible. With our array of cutting edge equipment we can make that happen for you – regardless of where the leak might be on your property. We also understand that what we charge is important so we do our best to provide our customers with the best possible value for money for what we do. We are also happy to visit clients living anywhere in the UK. 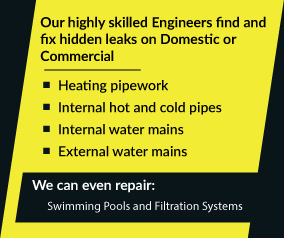 Call the leak detection professionals now by dialing 08007313843 – it’s the best decision you’ve made all day.